The House Rules Committee will hear SB 941 Wednesday. Hey, Oregon legislators, how about insisting on answers to fundamental questions about SB 941? The bill has been hotly debated, and yet basic bits of information about it are still missing. The House Rules Committee plans to hold a long hearing on the Senate-passed bill Wednesday, starting at 1 p.m. with invited testimony and continuing from 3 to 10 p.m. with public comments of two minutes each, with half an hour set aside for dinner. That sounds like a lot of talk, and I bet all of it has been heard many times before. So I hope the Rules Committee members will try to cut through all the noise and nail down solid information about the bill, which would expand the background check requirement to people buying firearms from their private owners. For instance, how many private gun sales are there on average? The Legislative Fiscal Office says, “The numbers of private party firearm transfers and background checks that will occur as a result of this measure are unknown.” But the report adds that the Oregon State Police anticipate 20,000 additional background checks per year, a number the agency can handle with present staff. Those additional background checks would yield $400,000 more state revenue per biennium. 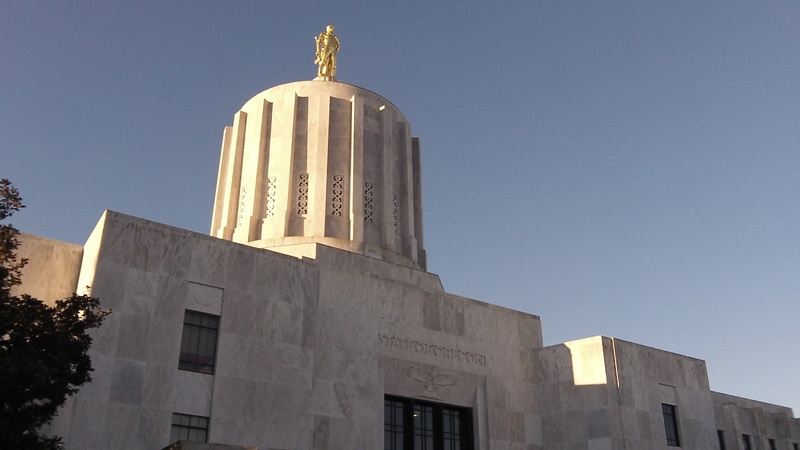 That’s another $400,000 out of the pockets of Oregon residents, but maybe to legislators that’s a minor point. Another question is about enforcement. The only way law enforcement could learn about gun sellers evading the new requirement is through undercover work. Agents would seek to buy firearms from private owners, and if the owners did not insist on the background check, they would be nabbed. Legislators should ask the state police and local agencies: Is that what you intend to do? If not, what’s the point of this bill because you won’t know how often it is ignored, and by whom. And finally: This is supposed to be weeding out buyers who are not allowed to buy firearms because they are felons or mental cases. If that’s all the state wants, then why does the background check form also cover the specifics of the firearm being sold? What does the make of a gun or its serial number have to do with the qualifications of the buyer? Good questions all, Hasso. We need answers to those questions and more. I have heard, and would like to know if it’s true….that under this proposed law, that if I wanted to temporarily transfer possession of my firearms to a trusted friend for safe-keeping and security during (say) an extended absence from home (or any other reason) that I would have to pay a fee, wait for a decision, and assuming it was approved…have to then again repeat those steps to then recover my OWN weapons upon my return? Subject to the GOVERNMENT’S APPROVAL? If that’s true, that provision is completely unacceptable ON ITS FACE. There is much about this that needs to see the light of day BEFORE it is passed. The last thing we need is another situation where “we need to pass the law to find out what’s in the law.”…. IF universal checks were the answer and their purpose is ONLY to determine someone’s eligibility to possess a firearm, then someone needs to tell me WHY on earth the government needs the details on the weapon itself. I smell a rat (de facto registration) and I will NEVER support such a measure. And for those that would like to convince me otherwise: Bring FACTS, not the same tired old debunked theories……….and BRING A LUNCH! With the Liberal bent of this legislative question, they aren’t looking for questions that would go against their agenda. The invited testimony, according to the agenda, is from both backers and opponents of the bill. On any issue, you can find people that are total idiots, both pro and con. Being able to pick and choose your “invitee’s” can totally slant things. The type and serial number of the guns being sold allow Oregon to maintain a database to check for stolen weapons being sold, a search they conduct and provide at no charge to the public. Private gun sales, ones that fall within the ‘gun show loophole,” run at approximately 20% of total gun sales nationally – a number that probably varies very little in Oregon. The text of SB 941 allows for the temporary transfer of a gun to another individual without the need for a background check – this so long as the individual making the transfer believes the individual the temporary transfer is being made to has no intent of using the gun in the commission of a crime. This along with transfer to a family member without the need to attain a background check as well.